Twisted SOS paper bags are a fully automatic machine made paper bag. As you can see from the image here, they can be printed to a very high quality finish, providing almost photographic quality. The handles are manufactured from a twisted white (or coloured) kraft paper, which is mounted onto the internal sides of the carrier bag via a glued paper patch. This ensures a strong durable handle that can be used many times. The paper itself is usually a high quality white kraft paper manufactured from a combination of virgin paper and recycled paper. Better quality papers are usually produced using virgin materials although todays environment is resulting in more quality papers to be produced from recycled materials. The finish can be left as a natural matt paper finish or sealed with a gloss varnish as here. This helps seal in the ink and projects a higher quality finish to the paper bag. Depedning on size, these bags can be printed up to 8 colours (including the process print), and so are perfect for a full photograph and pantone specific corporate logo. Due to the carrier bag being produced entirely of paper they are completely degradeable and can be considered an eco bag. 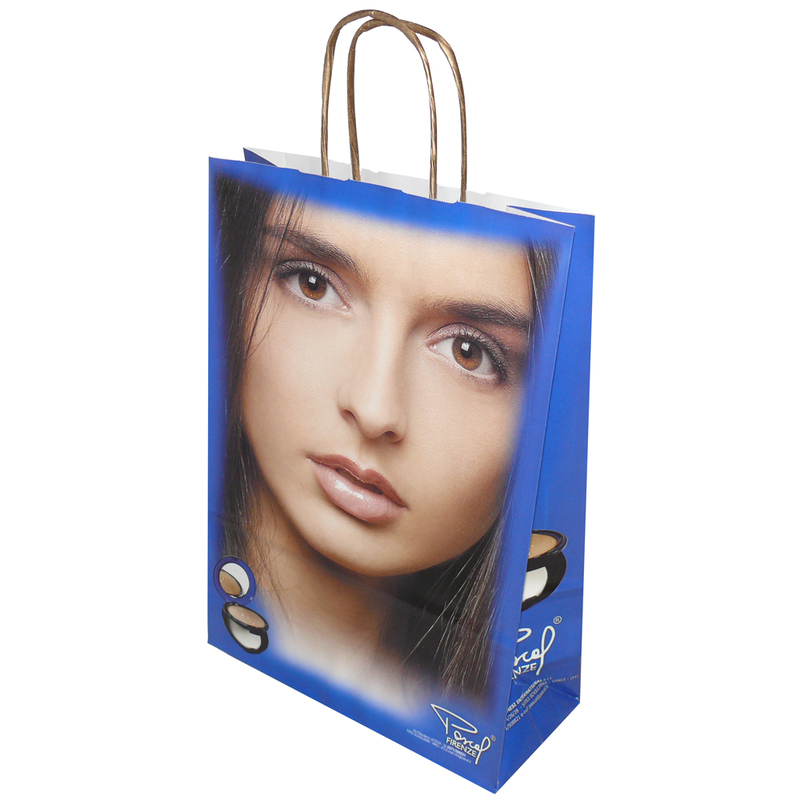 These bags can be manufactured from either white or brown kraft papers, although it is not advised to print full colour on to a brown kraft as the final colour will be affected. The bag sizes are usually determined by machine settings and as such our quotations will depend on what is available. This can either be what runs are due to be produced in the coming weeks, or what machine settings can be achieved. Printed: CMYK Process + 1 spot colour, 100% ink coverage, all sides. External print only. Beckdale offer a full design service for bespoke full colour twisted handle paper sos bag. The Companys staff love to help stores purchase unique full colour twisted handle paper sos bag. To discuss choose by material or similar , get in touch with our offices using your preferred method.